Painting is the most cost-effective way to enhance your home’s curb appeal, especially if you intend to do it yourself. But what colours should you choose? And what products will work best? These questions can be daunting. But the solution comes down to proper preparation. So to help you tackle this job with confidence, we asked the experts for their advice on what to consider before picking up a paintbrush. Consider colours that compliment the other houses in your area. When it comes to your exterior, you need to consider a few elements prior to selecting your colour scheme. One of these is taking into account the colour schemes of your neighbours (either side). 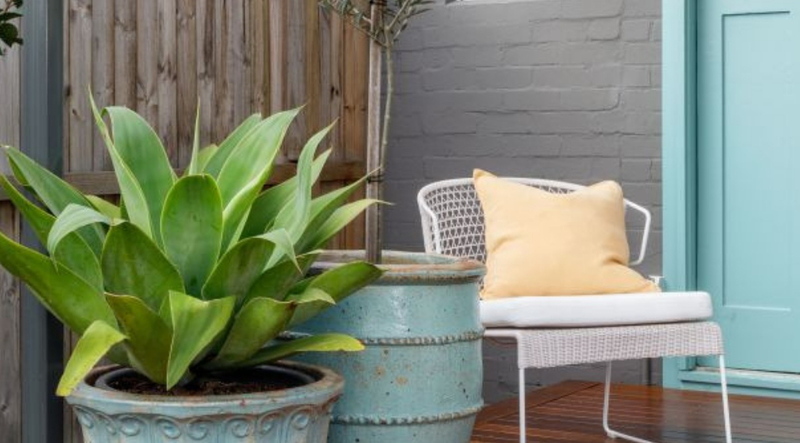 Given you are going to be living in the house long-term, it’s a good idea to consider the overall neighbourhood character when selecting the external colour for your home, says Aimee Tarulli, Interior Stylist of Thomas Archer. Whilst there are no legal regulations on colour schemes (unless you build in an estate), it’s more of a general courtesy to consider a complementary colour palette that is in keeping with the streetscape. A great colour scheme on the exterior should always take into consideration the permanent fixtures that are a feature of your home. Think about the roof colour, fascia, brick, stone, powder-coated windows, pavers and any other elements that cannot be painted or updated, explains Andrea Lucena-Orr, Dulux colour expert. In all of these elements, you will find subtle undertones and different colours and textures, so it’s important that these features work into the overall colour scheme and look like they have been chosen with purpose. Darker colours attract the heat, while lighter colours are more likely to keep your home cool. Most trends come and go, so before you get caught up on the latest exterior paint trend that seems like a good idea today, make sure to pause and consider whether you’ll be happy with this look in five, or even 10 years time. Consider the timeless appeal of your colour scheme in the years to come, explains Frank Tarulli, Director of Thomas Archer. While dark colours are on-trend now, know that trends may change. Frank also emphasises the importance of doing your research when it comes to choosing colours. He says painting an exterior in dark tones could mean having to re-paint every two to five years as darker tones show more wear. They can also make the inside of the home quite hot, especially on the first floor, which in turn, can affect your running costs significantly. The biggest payoff that comes from building or renovating your home is seeing the beautiful results that come from all the hard work you put in. With this in mind, minimising maintenance should always be a consideration so you can spend more time enjoying your home rather than working on it. For the longevity of your exterior, Steph Brodie, product manager at Dulux suggests using Dulux Weathershield, an acrylic paint for outside use that is self-priming on most surfaces. Dulux guarantees that this product will not blister, flake or peel for as long as you are living in your house, says Brodie. Another option is Dulux Aquanamel, a water-based enamel suitable for both interior and exterior. This is a great option as it’s hard wearing and chip-resistant, making it ideal for a high traffic area. Testing swatches before committing to a colour is just as crucial as inside the home. Testing colour samples is a great way to build confidence in your colour selection. Purchase a selection of sample pots in your shortlisted colours and test them out in different areas. Once you have your sample pots, paint a board with the different colours so that you can move the board around to different positions with different lighting, says Brodie. Make sure you check the colours in daylight and at night, as colours can change at different times of the day. Another option for this is using some Dulux A4 colour swatches, suggests Lucena-Orr. To ensure you’re happy with the colours together, try leaving the swatches out for about three days before you make your final decision. Before commencing a paint job it pays to be prepared. This includes starting with a clean slate by attending to all the imperfections so that the walls are clean, smooth and free of cracks. Make sure to also spend the time on the prep work so you can start with a great base, says Frank. There’s no point investing the time and money on new exterior paint if you haven’t prepared first. If the existing render or brickwork is damaged or needs to be repaired, spend the time and get this right before starting. Ensuring your walls are well-prepped with save you time and improve the durability of your paint job. Although you can’t control the weather, you can certainly plan around the forecast before starting. Not only will doing this prevent rain cutting a day of painting short and ruining what’s already been applied, but it will also affect how well the paint adheres to the surface. It’s always best to paint in mild conditions to reduce any changes in materials due to weather or the seasons, suggests Frank. For example, timber products naturally have a bit of movement, so avoid painting these types of exteriors in wet, cold conditions and also in extreme heat. Being mindful of this will give your new paint job the best chance of standing up to changes in the environment.